Can be used to count or detect the number of balls. Works with a hall chip built into the module. A small Neodym magnet is built into a rotating anchor. In order to measure a series of balls properly, a brake zone is built in. Without this braking zone the anchor will otherwise not have time to move back. The anchor has 2 extra holes of 4 mm. They can be used to place small steel axles as extra counterweight. However, I have tested it even without these extra weights and it works perfectly. The first hole of 4mm also serves to pull out the small magnet if you have the wrong polarity. I made a reference setup so that I have the correct polarity before pressing the magnet. In the module extra height has been kept free to use Fischertechnik blocks. These are indicated on the drawing. Original Fischertechnik parts are always easier to connect with other parts. These extra parts are also shown in the drawing. The output of the module can be made via a straight connection or a 180 degree connection. All necessary blocks are also shown in the drawing. For the hall connection I use a 3 pin female connetor. The wires of the hall can be easily connected without additional PCB. I swapped the 2 power pins of the hall output to the connector so the connector would have a standard connection: Output, +VCC, GND. This wiring then corresponds to that of a servo connection. The hall has an open collector output so it can easily be used on any kind of interface. Its power supply itself can be between 4V and 24V. The most commonly used voltage is 5V. A drawing is also included with the timing results for a burst of 5 balls. You have to take into account that sometimes the speed can be quite high (pulses about 25 msec). You may need to sharpen the brake zone ( adjusts the input so that the ball can just pass) if your controller cannot handle this speed. This is the case for the TXT Controller Fischertechnik. 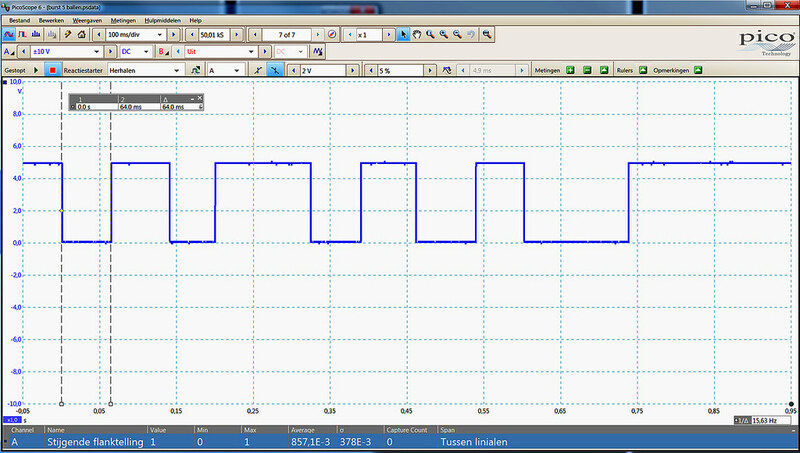 I use my FPGA controller to read the pulses and it never has speed problems. All parts are printed with the Flachforge Finder 3D printer. The filament used is PLA 1.7mm, 210 degree, Raft and Brim enabled, Infill 25%. PHabermehl hat geschrieben: Genius! I love it! I had forgotten some details. As a pivot shaft I use a part of a nail, this nail has a diameter of 2.15mm. In the body I drill the hole on D2.2 mm in the cover plate I use D2.3. This way the nail clamps in the body and you can easily remove the cover plate again. If you want to add counterweights to the anchor I drill them out with 4mm. This size is the same as the Fischertechnik steel shafts. I make the pins 13mm long and can easily press them in. The small spacers rings are 0.5mm thick and must be securely mounted so that the anchor can move freely. There is still enough clearance left in the body. Of course, you can use a different diameter for the spindle. You just have to adjust the drill diameter. The Neodym magnet in the side of the anchor is D2x3mm. I drill it out first with D1.9 and then on D2.0 1.5mm deep. This makes it easier to press the magnet in. If you don't have a D2x3mm Neodym magnet you can also use D3x3mm. Then adjust the holes. I have a series of drills from 1 to 10mm incremental per 0.1mm. This makes adjustments easy! I fully see the fine construction, but wouldn't a simple light barrier with a similar brake zone built just of a handful of fischertechnik parts not do the same job? Is size the main constraint here? Thanks for any enlightment! steffalk hat geschrieben: I fully see the fine construction, but wouldn't a simple light barrier with a similar brake zone built just of a handful of fischertechnik parts not do the same job? Is size the main constraint here? Thanks for any enlightment! You may have a reason to design something yourself. - it is technically interesting to design it. 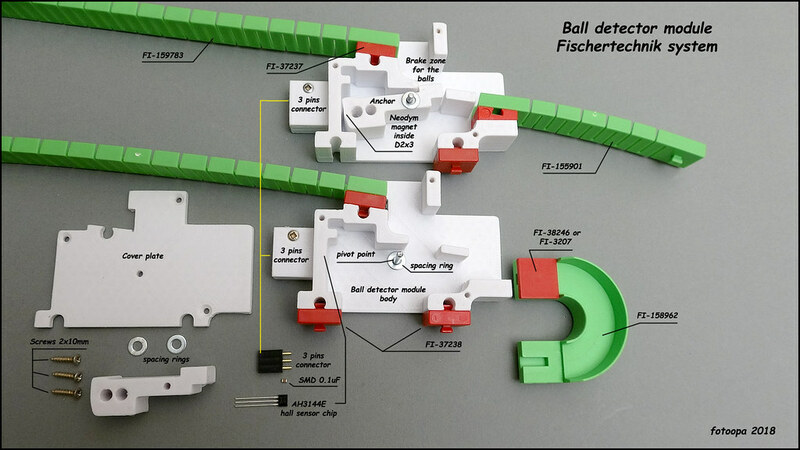 - You do not have a original Fischer sensor. - You want to solve the burst speed of the balls immediately in your design. - The cost price is also lower if you already have a 3D printer (less than €2.5). - A hall detector is not sensitive to strong ambient light, especially in sunlight a hall can be very useful. But you're right, the original Fischer solution is simpler for most users. Hi Frans, that looks really quite professional and the the info embedded in the images is instructive as always with your projects! I have to say that I share Stefan's initial reaction concerning your approach, though. Hovever, as you write, often "der Weg ist das Ziel" as we say in German, so who cares in the end? What I wanted to suggest to you: you could make it easier for people to find your designs at thingiverse if you add a Fischertechnik tag to your designs and add them to the thingiverse Fischertechnik group (the latter is only possible after having published the thing). I learned that there are many ft users at thingiverse who are not active here. Yes I am going to add some tags and also add them to the Fischertechnik group. 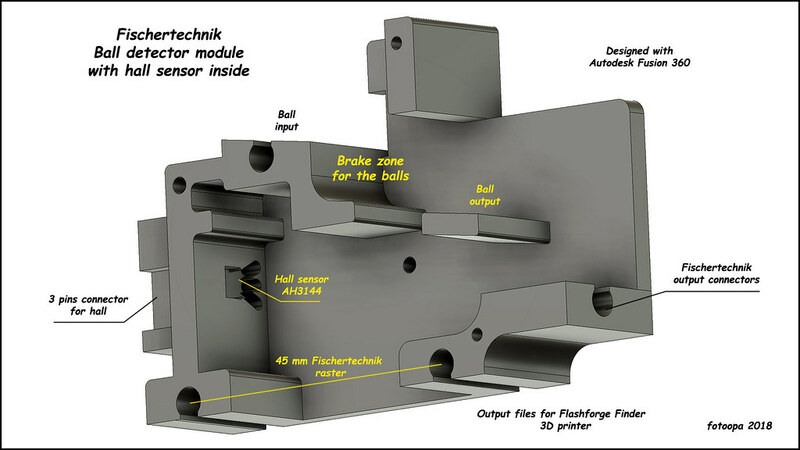 I am currently very busy drawing a new IR sensor module especially for the ball track. A first prototype has been printed and now I am making the necessary corrections. I am still waiting for an order for photo transistors (SFH313FA) and IR diodes (TSHA-6203) to do the timing measurements. 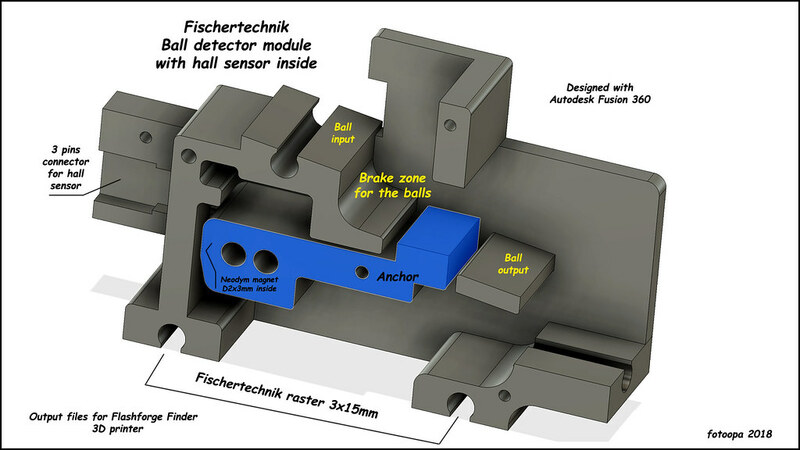 The design is very compact and compatible with Fischertechnik building blocks. The design is quite well thought out so that no PCB is needed. The phototransistor, diode and the 3pins connector are internal in the block. The total cost will be quite low, less than 2€. I hope that fast burst mode will work without problems and the power supply can be 5 to 9V. Components will be delivered next week. Do you plan to have this working by interruption of line-of-sight or by reflection? Because for the latter, there are of course modules which combine transmitter and receiver in one case. I have a couple of TCRT5000s lying around here which I plan to use for that purpose sometime in the future. I have already tested versions in a housing but they are far too sensitive to ambient light. Now I want to use versions with a good built-in narrow IR filter and in the version with 10° opening angle. The light beam output in the module can be adjusted in design, the output can have for example 3 to 4mm diameter. Angled light can no longer be inside. In the trackball loop there is only 15mm extra distance between 2 connecting shinnes. The center of the light beam is 2mm above the running surface of the ball track. This way I hope to get good signals with subsequent balls (burst). This sounds very fail proof, so it is probably the right approach. However, I'd be interested if you considered or tested a software solution to remove noise from ambient IR sources, as described e.g. here? As I use FPGA chips, the filtering is digitally processed. There I have great freedom without timings to influence other processes. First I need to have the components. Apparently the delivery is later than I hoped for. Bpost also failed the whole week with a delivery! Meanwhile, the prototype is ready. The dimensions are good. I tested the holes for the opto devices with other 5mm leds. Also the connector fits perfectly. I just have to wait and see before I can give new results.